Question I have several patients, mostly girls, who are living with Raynaud phenomenon. Does this condition appear in children, and what should be the course of action? Answer Raynaud phenomenon, described in the 1860s, can present in children and even in the first decade of life. 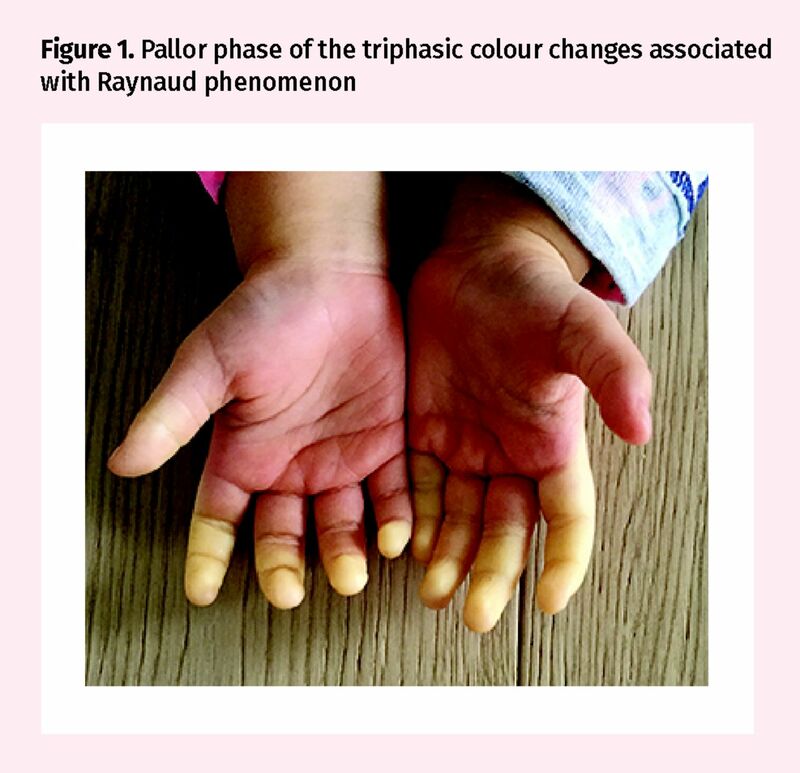 While most children will have primary Raynaud phenomenon, with no serious adverse consequences, in others it might be a sign of a pending systemic disease. Those children with a positive reaction to antinuclear antibody, specific autoantibodies associated with connective tissue disease, or nail fold capillary changes require referral to a pediatric rheumatologist and close follow-up. Raynaud phenomenon is recognized today as a transient vasospasm of peripheral arteries and arterioles that classically results in triphasic colour changes in the affected region, and it is associated with a variety of medical conditions.3 The vasospasm causes pallor (white), followed by dilation of the capillaries and venous stasis resulting in cyanosis (blue), and finally the arteries and arterioles dilate, causing rapid return of blood flow and reactive hyperemia (red)4 (Figure 1). The fingers are the most commonly affected region, usually as a response to stressors such as cold exposure. Most children (about 70%) present with primary RP, and secondary RP is associated with juvenile systemic lupus erythematosus, juvenile systemic sclerosis, mixed connective tissue disease, and rarely systemic sclerosis and Sjögren syndrome.5 These need to be ruled out in every child with RP. Based on limited evidence in pediatrics, a European expert panel recommended testing antinuclear antibodies, more specific antibodies associated with connective tissue disease, and nail fold capillaroscopy in all children presenting with RP.11 The frequency of follow-up recommended depends on the presence of these risk factors, with the aim of detecting evolving connective tissue disease early in high-risk individuals. Those children with a positive reaction to antinuclear antibody, specific autoantibodies, or nail fold capillary changes need a pediatric referral and close follow-up. Child Health Update is produced by the Pediatric Research in Emergency Therapeutics (PRETx) program (www.pretx.org) at the BC Children’s Hospital in Vancouver, BC. Dr Goldman is Director of the PRETx program. The mission of the PRETx program is to promote child health through evidence-based research in therapeutics in pediatric emergency medicine. , editor. The American Journal of the Medical Sciences. Vol. 108. Philadelphia, PA: J.B. Lippincott; 1894.
. The legacy of Maurice Raynaud. JAMA Dermatol 2016;152(11):1253.
. Clinical practice. Raynaud’s phenomenon. N Engl J Med 2002;347(13):1001-8.
. Management of Raynaud’s phenomenon and digital ischemic lesions in scleroderma. Rheum Dis Clin North Am 2003;29(2):293-313.
. The diagnosis and treatment of Raynaud’s phenomenon: a practical approach. Drugs 2007;67(4):517-25.
. Occurrence of Raynaud’s phenomenon in children ages 12–15 years: prevalence and association with other common symptoms. Arthritis Rheum 2003;48(12):3518-21.
. Primary Raynaud’s phenomenon. Age of onset and pathogenesis in a prospective study of 424 patients. Angiology 1994;45(8):677-86.
. The prognostic value of nailfold capillary changes for the development of connective tissue disease in children and adolescents with primary Raynaud phenomenon: a follow-up study of 250 patients. Pediatr Dermatol 2006;23(5):437-42.
. Raynaud’s phenomenon in children: a retrospective review of 123 patients. Pediatrics 2003;111(4 Pt 1):715-21.
. Raynaud syndrome in childhood. J Pediatr 1989;114(1):73-8.
. Raynaud’s syndrome in children: systematic review and development of recommendations for assessment and monitoring. Clin Exp Rheumatol 2016;34(Suppl 100):200-6. Epub 2016 Jul 27.